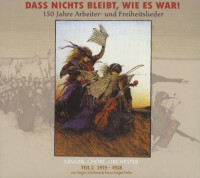 Various - 150 Jahre Arbeiter- und Freiheitslieder Vol.2, 1919 - 1928 (3-CD) Dass nichts bleibt, wie es war! Various - 150 Jahre Arbeiter- und Freiheitslieder: Vol.2, 1919 - 1928 (3-CD) Dass nichts bleibt, wie es war! 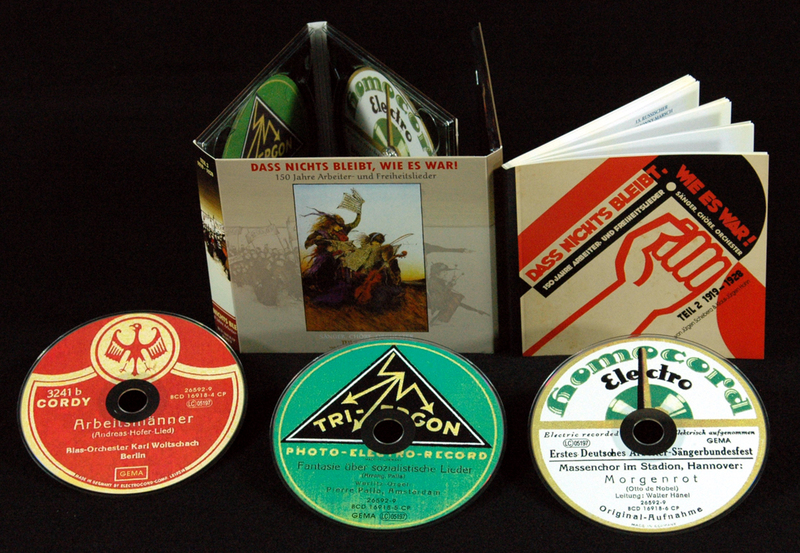 3-CD DigiPac (8-plated) with 108-page booklet, 70 tracks. playing time approx. 3 h 31 mns. Article properties: Various - 150 Jahre Arbeiter- und Freiheitslieder: Vol.2, 1919 - 1928 (3-CD) Dass nichts bleibt, wie es war! 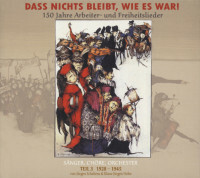 Album titlle: Vol.2, 1919 - 1928 (3-CD) Dass nichts bleibt, wie es war! 15 Es zog ein Rotgardist hinaus Schalmeien-Kapelle des R.F.B. 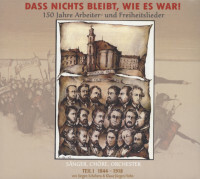 08 Wir sind jung (Kinderfreundelied) Arbeiter-Chor (Irmler-Männerc"
"Various - 150 Jahre Arbeiter- und Freiheitslieder"
With this CD album series 150 Years of Workers' Songs and Freedom Songs, the Berlin music historian Jürgen Schebera unfolds an important piece of German cultural history with more than 280 audio documents on 12 CDs. 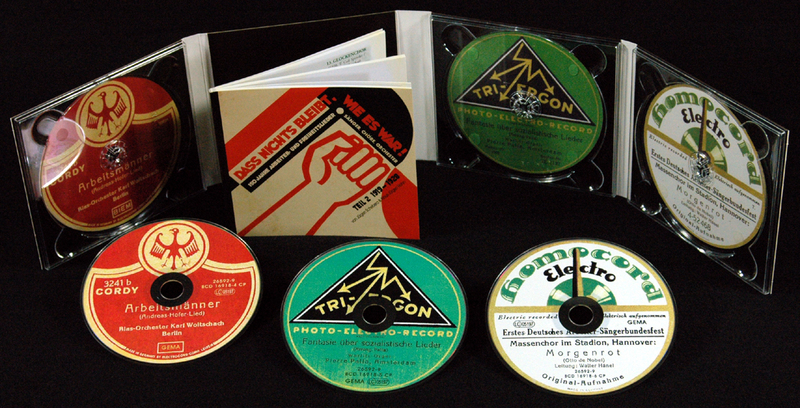 The musical testimonies also reflect the contradictory history of the workers' movement in all its phases. Songs of the struggle for political rights, for liberation from poverty, misery and exploitation, songs against fascism and war. And finally the songs of the new beginning, as it developed in the two German states after 1945. Forward and not forgotten, it says in the'Solidarity Song', with which Bertolt Brecht took up and continued the tradition of the old workers' song almost ninety years ago. The song became a hit. Millions made it their anthem:'Forward, never forgotten: solidarity!' But the times were not after that. A little later the Nazis came to power and ensured that the workers' movement was crushed and their songs could no longer be sung. After 1945, Germany West and Germany East went their separate ways. Before the two states became one again through a peaceful revolution. The German workers' songs fell by the wayside. Class consciousness is out. And with him the left songs that sang of him, that blew the march of the reactionary spirit and called to the last battle. 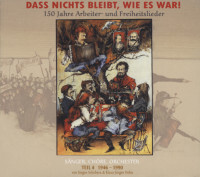 In addition to historical audio documents on this CD album series with 150 years of workers' songs and freedom songs, the most important newer interpreters of the genre can also be heard: from the legendary Ernst Busch to Hannes Wader, Dieter Süverkrüp and Franz Josef Degenhardt. In the booklets you can find the lyrics of all songs. Customer evaluation for "Vol.2, 1919 - 1928 (3-CD) Dass nichts bleibt, wie es war!" Vol.2, 1919 - 1928 (3-CD) Dass nichts bleibt, wie es war! 05 Takt, Takt! Auf Takt habt acht! 05 Auf, Auf, zum Kampf!